Some time back we had a family vacation planned for the restful town of Pondicherry, but seemed it would not be so peaceful and serene afterall, as a cyclone was about to hit the same place. 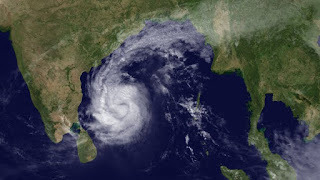 As cyclone ‘Than e‘ decided to gate crash our new years eve party, my brother had posted a picture of the cyclone as taken from a satellite. Meteorolgical reports showed the cyclone to be this big ball of fury with tentacles swirling outward. The cyclone was somewhere in the Bay of Bengal, but it’s swirls of destruction spead outwards reaching Pondicherry and outskirts of Chennai. On the same trip to Pondicherry , we also went to Auroville, a community of like minded people from over 35 countries who believe in The Mother’s dream of a place built on collaboration and real brotherhood. Auroville is an elegant fruition of a noble dream. With every aspect given so much thought and consideration that it is almost like an offering to a supreme being, an act of good, for the betterment of one and all. The museum and cafeteria, to the helpful volunteers working there and the elegant souvenir shops, the place emanated a kind of grace. Auroville , incidentally is built like a cyclone. The aerial pictures of Auroville show the MatriMandir, and an Old Banyan Tree at the very centre of this ‘cyclone’ with the rest of the buildings radiating outwards. This is not by default but by design. Auroville has the Matrimandir, at the centre of it. This is a golden globe inside which people meditate to a higher power. Since Matri mandir is for all people regardless of caste, religion or country;they have an optical sphere in the middle, towards which one can concentrate our energies. The ‘cyclone’ pattern of a central energy zone with radiating swirls around it, is not a unique pattern. We see it in Van Gogh’s paintings, we see it in science text books while depicting super novas, or even the milky way. We see it in the form of Krishna’s Chakra. Energy rarely goes outwards (or comes inwards) in straight lines. They are more like the Diwali ‘Charkhi’ rather than the firework ‘rockets’. These cosmic swirls can be seen in Tornadoes, to washing machines, to Mixer grinders. It makes you wonder, are all things originating from one point source and slowly radiating outwards, or are they coming from different parts and ultimately approaching a common end. Whatever our conclusion is, we cannot deny the importance of the centre. The whole cosmos may have begun from one and then BANG! Things started to move away at twice the speed of light. Or, we all seemingly different beings, are all slowly travelling towards are ultimate goal, the centre of OUR VERY BEING. Either which ways, we must admit that the swirling structures have immense universal appeal.